Last night's Giants game was about as heartbreaking as you can get for a team that is in 4th place and more than a week out of 1st place. It felt like a whole new way to lose a baseball game, but it really wasn't. Just like any other game there are many factors that lead up to the one crucial play that gets remembered forever. Take the bottom of the 2nd. After Pablo Sandoval led off the inning with a double the Giants failed to score. Hunter Pence grounded out to 3rd and Pablo stayed at 2nd. Brandon Belt then grounded out to 1st, it moved Pablo over, but now there were two outs. Had Pence been able to move Sandoval to 3rd then Belt or Francouer would have had an easier chance to knock him in. Let's go to the top of the 6th. With 1 out Nate Schierholtz hit one deep to the left center field gap. Both Francouer and Blanco too bad routes to the ball and did not communicate. They both pulled up a little and the ball fell in. The play looked like it could have been made. The very next batter, Starlin Castro, hit one towards the middle that Tony Abreu dove for, and over shot the landing. The ball went to the outfield and the run scored. Abreu needs to knock that down even if there is no play to be made. How about that 9th inning? A leadoff single to Borbon, followed by a 4 pitch walk to Dioner Navarro. Romo got the next 2 guys on a strike out and a force out. Anthony Rizzo came to the plate with 2 out and runners on 1st and 3rd. The only two left handed hitters Romo had faced in the inning had reached safely. Romo's the closer, and in the world of baseball that often means going with the guy that got you there. But in the world of instant social media, it all comes down to Belt. In the world of knee jerk reactions, and what have you done for me lately, it all comes down to Belt. In our world of hype, and wanting the next best thing, it all comes down to Belt. I don't live in the Bay area. So when Brandon Belt was hyped to be the next great thing, I knew nothing about it. When everyone had high hopes, and big expectations, I was just curious to see how the new first baseman was going to play. It's the expectation and promise that has colored the view of Belt. Brandon can be engaged through Twitter, share his fondness for Olive Garden, and write a decent blog post now and then. But if he dare strike out just once in a fly ball situation, a collective roar about potential not being reached emerges. Suddenly the guy that makes us chuckle is scorned. I'm not buying it. 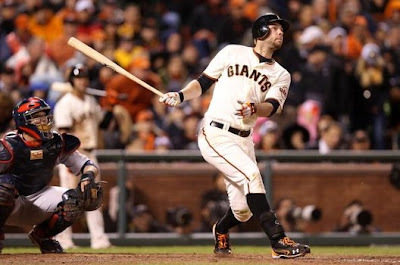 The cornerstones of this Giants team should be Posey, Crawford, and Belt. From a pitching standpoint, it's Bumgarner and Cain. It's one error by Belt. He has saved countless more with his glove in the past. The Giants as a team lead the NL in errors. One ball through the legs shouldn't condemn a man's time in a Giants uniform. I don't look for the next great thing, a solid Major League player will be enough for me. The San Francisco Giants have that in Brandon Belt.